After we arrived at Harbin from Beijing by airplane, we had dinner at Orient King of Dumplings on the way to the hotel. Orient King of Dumplings is a chain restaurant found in Harbin, Beijing, and other major cities across China. Jiaozi and goutie are unique to Northeast China (Dongbei). We ordered jiaozi, goutie, and a few other side dishes. Before the dishes arrived, we went over to a sauce bar next to our table, to create our own sauce! There were 12 different sauce and spices to choose from! And then the jiaozi (dumplings) arrived! The ones we ordered were filled with vegetables. Harbin is at the Northeastern part of China, where nights can range from cool to cold. The hot jiaozi warmed us up! Then the goutie (potstickers) arrived at our table! We had three different kinds, two with meat and one with vegetables. I thought the meat filled goutie tasted way better than the vegetable filled goutie. 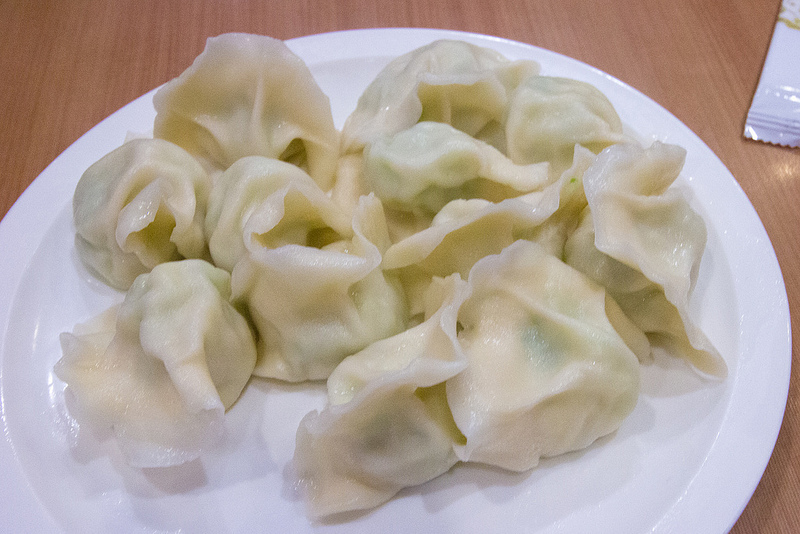 Northeastern potstickers are flatter and shaped longer than the Cantonese counterpart. Eating jiaozi and goutie in China is nothing like eating them in the States. It’s one of the must-eat dishes in Northeastern China. So, don’t miss out on these if you’re in town!